The present popular and official name of this barrio is Nausok. In the past, the place was popularly known as Kato-ogan. There are several places included in this barrio such as Walihan, Buayahan, Kato-ogan, Companiza, Karahan Ke-Centino, and Ka-Eloy but they cannot be considered as sitios for they are merely points or places which mark insignificant uninhabited places. 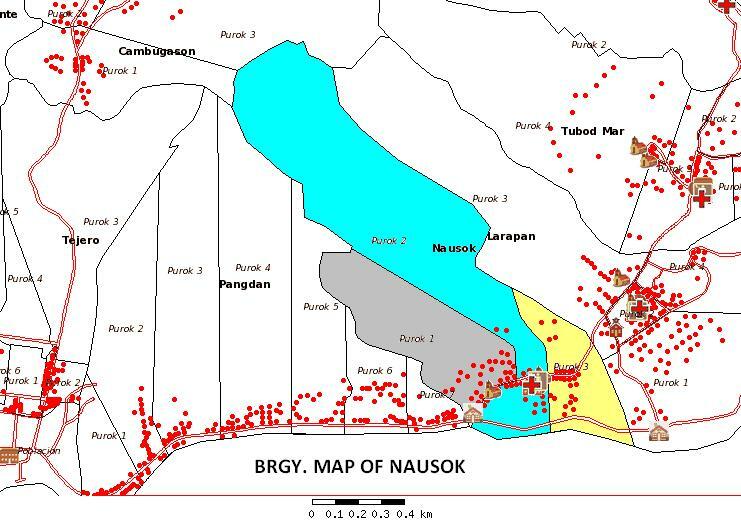 Nausok Gamay was the only sitio of the barrio before, but the said sitio is now a part of Larapan because of its geographical location. There are two versions if how Nausok got it’s name. One goes like this: when two Chinese traders landed in Guinsularan and passed by Kato-ogan, they found the inhabitants who were armed with bolos and usok (very sharp long wood) to be very hostile. The people of Kato-ogan noted that the strangers were Chinese traders. The Chinese traders however , did not challenge the natives to a fight but instead befriended them. Upon being asked of the name of the place one of the natives answered ‘Usok’ referring to the sharpened woods. Not really understanding each other, the Chinese then called the place Na-usok; hence, Nausok. Another theory takes its roots in the assertion that because the seat of the barrio is far from the old road in Kato-ogan. the earlier residents called the place “Nasu-ok”, meaning in the corner or “interior”. It is said that when the barrio was organized, the Spaniards confused Su-ok or Usok, consequently calling the place Nausok. 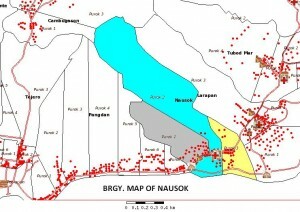 Nausok is one among the barrios of Jagna organized towards the end of the eighteenth century. There were five groups of original families of this barrio: Gabriel Acedo wife Juana Acas; Pedro Acas wife Fernanda Galagala; Gregorio Ladera wife Sabina Acedo; Cresente Galaura wife Asza; Antonio Galiza wife Namesia Ladera. First leaders / Cabiza del Barrios were Basilio Acedo Cabiza, son of Gabriel Acedo and Lino Galaura Cabiza, son of Cresente Galaura. Teniente del Barrios were Antonio Galigao, Gervasio Acas, Tirso Galiza Sr., Nazario Acas and Bonifacio Acedo.